After falling behind Facebook Inc.’s WhatsApp and Facebook Messenger, Microsoft’s Skype and Apple’s FaceTime, it appears that Google has once again decided to compete in the video calling and messaging app arena. It has now come out with its new service called Google Duo. 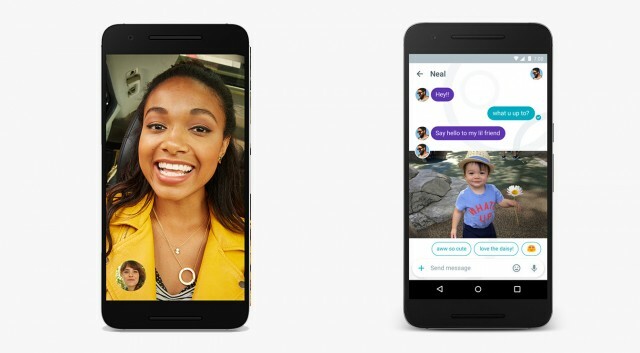 After Hangouts, this is Google’s second attempt releasing a new communication app. Since video seems to be the way forward, Google has emphasized on video chatting in this application. It has been released for both iOS as well as Android devices and works on both WiFi and mobile data. One of the main reasons that Google fell behind all the other messaging and video chat applications was that it required a Google account in order to use the app. Now, not everyone wanted to change their email account just because they wanted to have a video calling software and considering the abundant options available in the market, this requirement that Google had added to Hangouts explicitly directed it towards failure. With repentance in mind, Google, therefore, announced two apps in its annual conference of 2016. So let us now take a look at what Google is really offering in this new app. The Google Duo is a cross-platform app available for both iOS and Android. It runs both on WiFi and mobile data, and it has a mechanism that continuously scans the speed of the connection and adjusts the video accordingly so that there is no lag a disconnection during the call. This arrangement also reduces a video call to a voice- only call if it understands that the speed of the connection is on par with a 2G connection. Now users may start questioning as to what the essential difference is between Hangouts and Duo. Let me tell you then; Hangouts was a service which was created by Google keeping the office environment in mind, due to which it supports features like video conferencing which one does not usually need for private use. Also the fact that Hangouts has Google’s office software integrated into it proves that it was built more for office use. Hangouts offered software support for Google Docs, Google Slides as well as Google Sheets. Google Duo does not have these features or support. Google Duo has and will continuously hear about its similarity with Apple FaceTime, but there is a Knock Knock feature on this app that enables users to get an inkling of a video call that he/she is about to receive even when the phone is locked. FaceTime also has this feature but in the case of Apple, it does not work on a locked screen. Google has endeavored to create a consumer centric app that is only and exclusively made for video calling. It has no other functions apart from one-on-one video calling. Also keeping in mind, the data prices hand the consumer’s tendency to go for apps that consume less data duo has also been created keeping in mind the optimization of data. Like WhatsApp, and other messaging apps, be it video or text, Google Duo has also come about with the end to end encryption feature. Google seems to have learned from the mistakes it had made with Hangouts and therefore it has come out with Duo needing only a phone number for the verification. The other app that was announced during Google’s annual conference of 2016 was Allo. It is supposed to be a text messaging app from Google, and it is expected to be released sometime in the second half of 2016. Google has done the right things in order to make the app attractive but it remains to be seen how it fares. A pointer, however, is the fact that Google has been late in arriving in almost every field but following sometime after its inception it has always managed to rule. It, therefore, remains to be seen whether the most powerful entity on the Internet can make it happen one more time. How to get Google Duo? As previously mentioned, Google Duo is available for both Android and iOS and, therefore, you will get the app on both the Google Play Store as well as Apple’s iStore. You just need to put in your phone number after you download and install the app. Once this phone number is verified, you are free to use this app and call anybody.